ISO 50001 International Standard for Energy Management System (EnMS) has just gone into third year of its superior deeds. 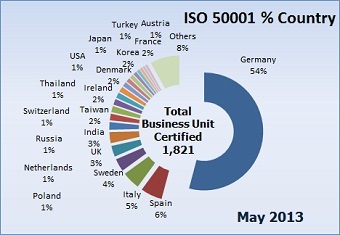 We took liberty in analysing the valuable ISO 50001 certification data supplied by NAGUS - German Federal Environment Agency to update the certification situation as at the end of May. Compare to the March figure, Germany continues to show impressive increase of 516 sites and 369 business units, UK contributes with increased certified sites from 138 to 315, increase of 177 despite the number of BU increase is held to 9. Other than Germany and UK, Spaing , Italy and Ireland made a strong increase over the two months period. 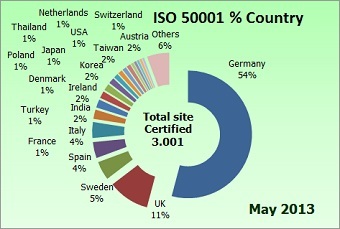 It would be interested to see how the third year would develop for ISO 50001. Although number has exceeded 3,000, it has to be noted that this is due to the strong showing by Germany. Without German showing, many coutries including my home land Japan need to review the status. Government and the private sectors have to take a close look at the essence in the benefits of adapting the ISO 50001 class EnMS operation. They need to go back to the basics. I regularly view and listen to the great speech made by Rob Steele, ISO Secretary-General, at the 2nd International Conference on the Global impact of Energy Management Systems “Creating the right environment for ISO 50001 to thrive” - SEAI, Dublin, Ireland - 4th May 2012. （15 minutes speach can be accessed here） He was very determined and clear about the ISO 50001 superiority. In his speech, he made clear that ISO 50001 followers require continual effort in promoting the standard especially to the top management level of energy user organisation or business units. EnMS-Doc Associates is also celebrating our 2-year anniversary as we started our operation in harmony to ISO 50001 introduction. We commit to promote as many business units establishing and implementing ISO 50001 class EnMS operation. 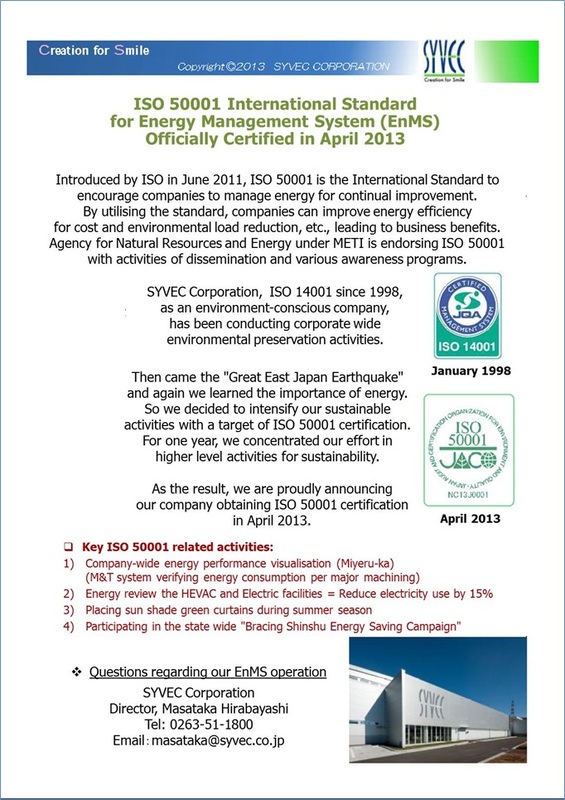 Place attention on China and Japan being far ahead on ISO 14001 and ISO 9001 certification but very slow on ISO 50001. It has been one of our seven wonders that Australia and New Zealand known as taking pioneering role in energy management system, have yet to appear in the certification list. we want to check the situation. Continue Learning from US SEP program initiative in verifying energy performance improvement in line with the ISO 50001 standard. Author of "Energy Management in Business", Kit Oung and www.2degreesnetwork.com (Energy & Carbon management) are running competition: "How to create a best practice energy management strategy" Deadline: 12 July 2013. Download a copy of the case study about the fictitious Wesh Pharmaceutical. Read it through bearing in mind: What are the 'hard' and 'soft' issues faced by the organization? In order to meet regulatory compliance, what options are open to the company? Are they missing any tricks in reducing energy consumption? Email Stephen Kennett (stephenkennett@2degreesnetwork.com)Community Manager, 2degrees in no more than 500 words your strategy for addressing their energy management challenges. About "Energy management in business"
The fictitious Wesh Pharmaceutical case study is an excerpt from Kit Oung's recently published book “Energy Management in Business” from Gower(ISBN 978-1-4094-5245-4 (hardback) ISBN 978-1-4094-5246-1 (eBook)) EnMS-Doc's Nobby Yamanouchi treasures the book acting as his everyday reference workbook. Not only he admires Kit Oung’s in-depth knowledge in EnMS but also for his skill in communication which allows his valuable idea easily appreciated and applied. 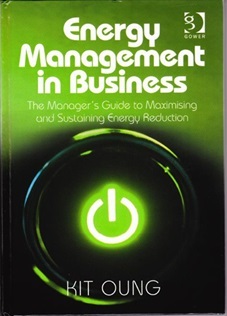 The winner of this competition will receive a hardback or e-book version of "Energy management in business"